Giro d’Italia race leader Alberto Contador (Tinkoff-Saxo) was on the start line for stage seven despite dislocating his shoulder in a high-speed crash in the finishing straight of stage six on Thursday. Contador’s team said in a statement issued on Thursday evening that a medical examination had confirmed the shoulder dislocation, and that a further assessment would be made this morning. The Spaniard was present at the sign-in ahead of the 264km stage to Fiuggi on Friday morning and confirmed on Twitter that he would start the stage. In 1hour I'll be at the start of the stage. They have protected my shoulder and hope it will not go out again.Will be a hard day with 264km. “I feel pretty well, not counting everything that happened,” Contador told reporters before the stage. “What is important is to have a strong head otherwise it’s hard to even get on your bike and go. Contador looked to be in difficulty on the podium after the stage when collecting his pink jersey, and declined putting it on or opening the traditional bottle of Prosecco in celebration, though he continued smiling throughout the ceremony. “There’s no tendons torn or any fracture, so it’s pretty good,” said team doctor Pete Daniels. “We just have to make sure he doesn’t make certain movements. The incident will undoubtedly bring back memories for Contador of last year’s Tour de France, when he was forced to withdraw from the race with a broken tibia after a crash on stage 10. The crash occurred just as the sprinters were winding up to full pace for the stage finale. Contador was among several riders to fall. Although yet to be officially confirmed, it is alleged that the crash was caused by a spectator with a long camera lens leaning over the barriers at the road side. Italian Daniele Colli (Nippo-Vini Fantini) came off worse when he fell. The television coverage briefly showed Colli with his arm hyper-extended after German André Greipel (Lotto-Soudal) sprinted to the stage win. Contador is aiming for the Giro d’Italia and Tour de France, but the crash could end his hopes for the rare double. If he were to pull out, then Italian Fabio Aru would take over the race lead. Sky’s Richie Porte currently sits third, and would move up to second. “You know you have the three-kilometre rule, so they are safe there, but of course if there’s no crash and there are gaps, then they are still not safe because they lose time,” Tinkoff sports director, Steven De Jongh said while sitting on the curb next to the bus waiting for updates on his team’s star. Contador fell as a result of Colli’s crash in the final kilometre of the 183-kilometre stage south through Tuscany from Montecatini Terme. “It was a good final stretch, not really that dangerous, but we know that anything can happen,” two-time Giro winner and Contador’s team-mate, Ivan Basso said. 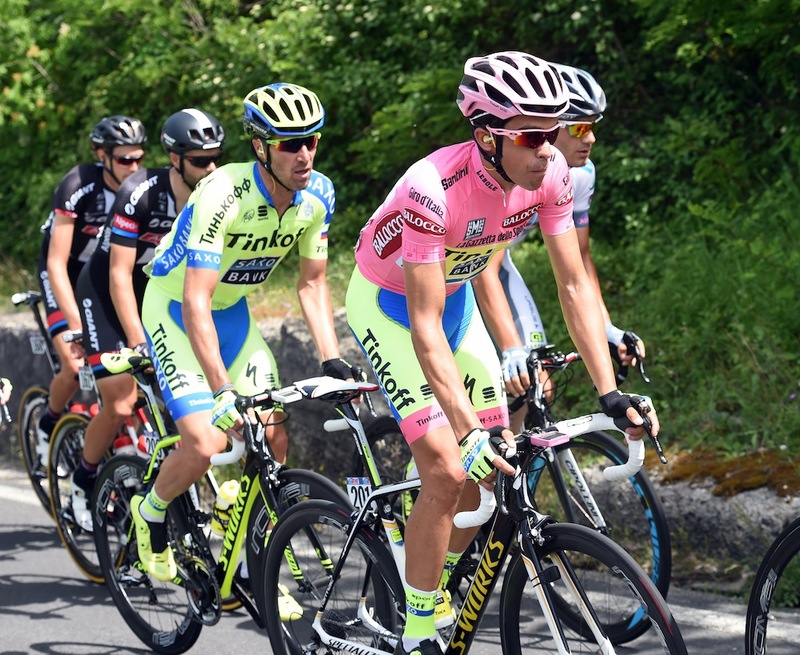 Contador may suffer from his crash as the Giro continues. The remaining 189 cyclists face their second summit finish on Saturday. Or the 32-year-old may have to go home to Madrid’s outskirts depending on the medical checks. Sprinter Colli will have to say ciao to the Giro d’Italia. The images showed him on the road with his Nippo teammates around him for support and his left arm stretched out in the wrong direction. It was later confirmed via X-ray that he’d suffered a compound fracture of the left humerus. “Sometimes you just have to turn your head when the TV shows things like that,” Nippo sports director, Stefano Giuliani said when he arrived by car to the team bus. A teammate rolled Colli’s bike to the bus as he rode on his. Giuliani heard that someone was leaning out to take a photograph on the left side of the finishing straight. Colli hit the fan as he was speeding by going around 50 to 60kph and fell to the right. Contador and many others hit the deck soon afterwards.